The Legal Tech Innovator Showcase will promote the law firms, legal service providers, and companies that are using technology to improve legal services in the Chicago area and highlight those whose innovations are exceptional. Whether the end result is better legal knowledge management, more affordable legal services, or improved metrics for decision making and analysis—and regardless of how the services are delivered—we want to hear what you are doing, and so does Chicago’s legal community! Submissions for consideration are due September 29 and the Showcase event is October 24th. 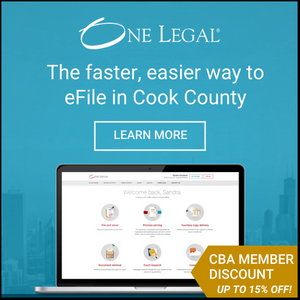 Additionally, the Chicago Bar Association Member Discount technology partners offer training, demonstrations, and webinars. Check the schedule for their events below.